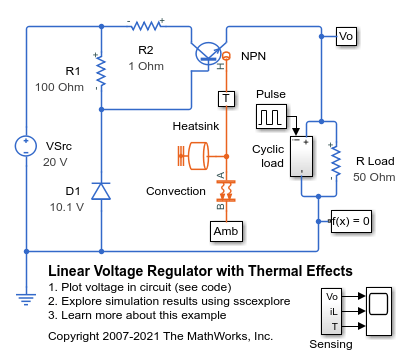 This example shows a low-cost voltage regulator circuit whose performance depends on both load current and temperature. Bias resistor R1 ensures that the voltage at the transistor base is close to the rated zener voltage. The regulator output voltage is also approximately at this voltage, the base-emitter voltage being a few tenths of a volt. The precise base-emitter voltage depends on the transistor working point (which in turn depends on the load) and also the temperature. Resistor R2 only serves to provide some protection in the event of a transient output short circuit. This type of model can be used to validate that selected circuit components result in an adequate level of voltage regulation. It can also be used to size the heatsink required to keep the transistor junction temperature within the permitted operating range. By modeling both electrical and thermal properties, understanding of the trade-offs between electrical and thermal parameter choices is gained. Better regulation can be achieved by using feedback. 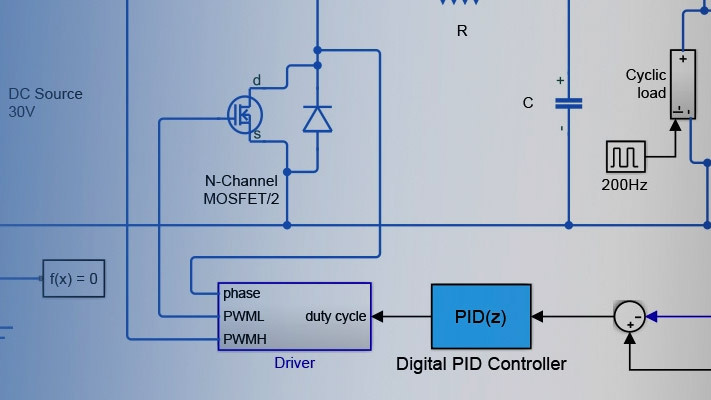 See example Linear Voltage Regulator with Feedback (>> ee_voltreg_linear_feedback). 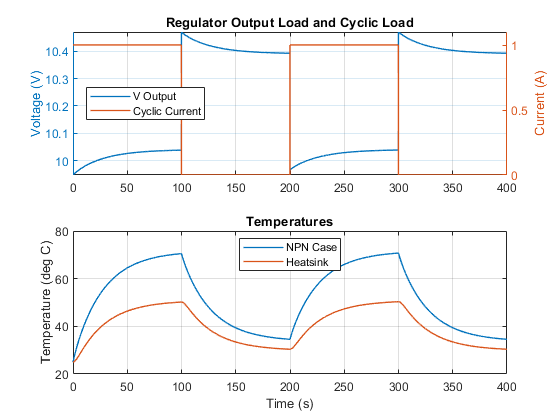 The plot below shows the output of the voltage regulator holding close to the desired output of 10 V. It also shows the temperature of the NPN case and its heatsink as the cyclic load turns on and off.